Gravitational theory. Causes of Newton's Universal Law of Gravitation and the global gravitational acceleration. Definition, nature and physical mechanism of gravitational interaction. Newton integrated force of gravity on Earth with the force that governs planetary orbits through his mathematical Law of Universal Gravitation, but he did not give any reasoning of the mechanical causes to support it. Newton himself commented that he did not like forces at a distance. Subsequently, Einstein’s Theory of Relativity added a slight distortion of space to fit the planetary orbits to astronomic observations. If the Law of Universal gravitation was a purely mathematic law, General Relativity uses mathematical equations so complex that not only the physical interpretation is elusive, but also the precise description is imaginary in the majority of cases. A friend from Mensa, the herbivore, upholds Einstein’s theories and always had a vivid imagination. It seems that two different causes would have to exist in the theory of gravitation. One would justify classical gravitational force or Newton’s Law of Universal Gravitation and, the other, the distortion of the anomalous precession of Mercury’s orbit explained by Einstein’s General Relativity in 1915 with the same formula used by Paul Gerber in 1898. Mathematically, Newton and Einstein resolved the problem more or less, given that they make possible quantification of energy exchanges, due to the gravitational forces, between kinetic and potential gravitational energy maintaining mechanical energy. The gravitational interaction is responsible for variations between kinetic and potential elastic energy associated with a mass in the global or gravitational aether –reticular structure of the matter– with radial symmetry. An approximation to the mechanisms of gravitational aether interactions with the bodies with mass and, through luminiferous aether, with electromagnetic energy appears in the book Physics and Global Dynamics, in the section on Physics of motion with an analysis of dynamics of light movement and the bodies with mass in free fall. On the other hand, in this book’s section on Energy experiments, calculus of light curvature in the gravitational lens and perihelion precession of Mercury’s orbit are studied. However, a mathematical formula is one thing, and the underlying physical explanation another. Atractis causa topic is intricate due to the existence of two components of gravitational forces. One would explain the acceleration of mass associated with Newton’s classic Law of Universal Gravitation and, the other one, Einstein’s imaginary space-time distortion regarding the anomalous precession of the planetary orbits added to Celestial Mechanics. The fact light deflects in a gravitational field precisely double than mass according to Newton’s Law of Universal Gravitation makes us suspect that there must be some special relationship between the causes of both deviations. Global Physics also resolves the problem of calculating the gravitational force with the Law of Global Gravity. In this formula, global mass does not appear because, doing this would place it on both sides of the mathematical equation, and it would force a reformulation of the equation. Gravity force between two bodies is also inversely proportional to its distance squared. This formula of gravity acceleration is equal to Newton’s Law of Universal Gravitation if we take into account the direct effect of velocity on gravitational interaction. Understanding always velocity measured concerning the natural reference system provided by global, gravitational or kinetic aether. According to the mathematical laws proposed by Global Physics, the force of gravity is due to two atractis causa components, depending on the following variables. Gravitational force is proportional to total mass, that is, mass at rest plus the mass equivalent to kinetic energy. Increase in force of gravity due to increase in total mass does not affect Mercury’s orbit, given that bigger force of gravity must accelerate the greater total mass. Consequently, in both formulas –global gravity with only the first component of atractis causa and Newton’s Law of Universal Gravitation– the mass of the body affected by gravity force does not appear; and both results would be identical concerning acceleration. This second component is half the force of gravity that the kinetic energy of global mass would suffer due to its speed, which is equivalent to the electromagnetic energy needed to reach the mentioned speed. Remember that curvature of light because of gravitational lens effect is double than the deviation of the mass. One part compensates the increase in total mass, and the other makes up this second component of atractis causa. In order to add the equivalent mass of kinetic energy to Newton’s Law of Universal Gravitation formula it is necessary to correct its value by 2π, 2 given the double effect of the gravitational interaction of kinetic energy and π due to the character of linear acceleration in the equation above. It is an issue similar to the difference between Planck’s constant and reduced Planck constant. The Law of Global Gravity represents energy transfers between the gravitational aether and the mass, and between luminiferous aether and electromagnetic energy; therefore, pertinent magnitudes are always different types of energy; what is more, the mass is a manifestation of accumulated elastic energy. The second component of atractis causa is named Merlin effect due to its repercussions on the movement of bodies with mass (Mercury) and the propagation of light (Lighting). Difference between Global Physics and General Relativity is that while Einstein uses kinetic energy to alter space-time and balance the planetary orbits, Global Physics defines an additional force or second component of atractis causa, also adjusted by kinetic energy, to explain the physical reality without altering it. As previously mentioned, Newton was aware that his theory did not explain the mechanical mechanisms of gravity force, what he called forces at a distance. Modern Physics not only does not explain the mechanisms of physical reality providing energy for accelerations in the space-time continuum or, at least, where and when these mechanisms act, but it also casts doubts on the most basic concepts of its raison d’être, such as physical reality, space, and time. Global Physics attempts an approximation of said mechanisms through the interaction of gravitational or kinetic aether with mass. The bewitched heart figure allows for an intuitive understanding of gravity force because of vibrations of the gravitational aether. 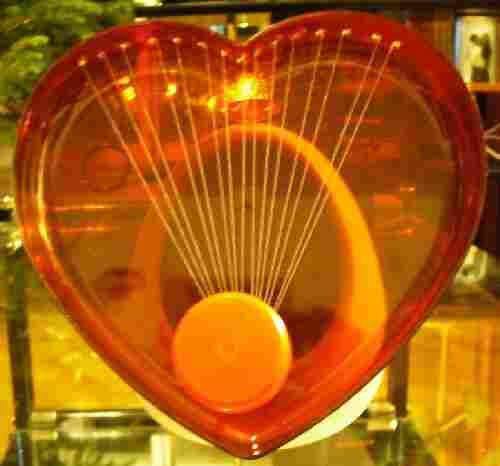 If we make the strings in the heart vibrate, any mass or energy property on them will tend to move upwards –to where the strings are most separate–, on condition that said body has a neutral spatial orientation. If the object’s shape were like a black triangle, it could well move to the contrary; then its spatial configuration would mean a greater effect on energy exchange than that of spatial configuration of the strings. A more in-depth analysis of motion is in the section on Physics of movement with gravity from the book Physics and Global Dynamics. As a straightforward, but a not exact example, it can show that the additional gravity force due to vibration or movement or the object on the strings would define the Merlin effect, or second component of the atractis causa because it would produce more points of contact and energy exchange. With same limitations of an imperfect example, it is also worth considering the energy exchange of a pigeon flying with or without wind. Remembering Global Physics characteristics of Euclidean space, absolute time and of being renormalizable, we would say that the mechanism of gravitational interaction is the same one for deviation of mass and light curvature. In other words, it is equal to the effects of Newton’s Law of Universal Gravitation and those of Einstein’s Theory of Relativity about planet’s orbits. In fact, we are describing the unification of both atractis causa components. In this sense, what changes from one case to another is perspective and quantitative effect of the only existing mechanism. The question of mass spatial configuration in gravitational interaction is significant since it allows a more precise explanation of other concepts that are now, due to so much relativity and uncertainty, somewhat confused, such as those of motion, force, time, space and velocity. Moreover, both Law of Global Gravity and Newton’s Law of Universal Gravitation not only can appear regarding energy instead of mass, but it would be more suitable. After all, the chosen units do not alter the outcome, as an example, one can refer to the field equations of Einstein’s General Relativity, with its conversion to geometric units. The atractis causa components will be examined in more depth when discussing the motion, kinetic energy and the Laws of Global Gravity themselves; taking into account the nature of light and mass according to Global Mechanics.